This is a painting of the Celtic, the 75-foot fish tender I lived on with my mom, off and on (on most summers, off some winters) for five years when I was a kid. Some of you will remember the short story I wrote about that time called “The Gift” (click on the link to read an excerpt) which was published in Alaska Women Write. In the meantime, Brad hooked up with Jim Cobb, a local gent who also spent time on the Celtic and who evidently has an eidetic memory, because he proceeded to sit down and draw Brad a schematic drawing that looks like it just came off the marine architect’s drawing board. 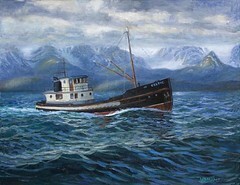 From that Brad painted this painting, which was reproduced for the cover of the K-Bay Seafest insert in the Homer News. Which was where I first saw it. And immediately bought it. It looks like it’s coming out of Bear Cove bound for Homer, with Chocolate Drop (pointy mountain that looks like a Hershey’s Kiss) off the port bow. Brad’s a very talented graphic artist as well, his presence is felt all over Homer in the way cool signs for places like Alice’s Champagne Palace and Smokey Bay Natural Foods and Frontier. Click here to check out his website. 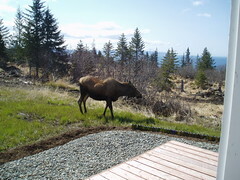 And here’s a photo of one of the moose who have been hanging out around my house this spring, waiting for me to plant my garden so they can eat it. She’s pregnant, and her left hind leg is messed up, the knee kind of giving out from under her when she puts her weight on it, so I don’t know if I’m going to see her again. Mind you, I’m sorry about that, and I hope mother and child make it, I really do, but mostly I’m hoping she doesn’t die in my front yard. If she does, I’ll have to pay someone to haul her away or wait for the eagles and the ravens to pick her clean. Either way, it will be one smelly mess. You didn’t know I was this hard-hearted, didya? What can I say, it’s the Alaskan in me. First off, thanks for putting up the lovely photo of my better half holding up FIRE AND ICE. We celebrate our 32nd wedding anniversary on the 5th of June and he does look very nice in shorts, hehehe. I was just wondering where Kate 16, WHISPER TO THE BLOOD is in the whole publishing process. Do we have a publishing date yet? It was my very great pleasure. I FedExed the copyedit of Kate16 to NYC yesterday, they tell me it arrived today. Now it goes to the type house to be set into the print as you will see it in the finish copy.